Database Specialist, working for more than 12 years with all commercial databases on major platforms including Linux! S/390 is a robust hardware platform from IBM for large enterprices. Linux is now running on it. When the Linux Operating System first appeared on 1991, it's been working on IBM PC Compatibles. Since then it has been ported to many other architectures such as Apple, Atari and 68000 based Amiga computers, Sun Spark workstations; Alpha based personal computers and MIPS, PowerPC, HP PA-RISC and ARM. S/390 is the name of the mainframe type computer architecture from IBM. This architecture has been used widely with IBM's VM, VSE and z/OS (former MVS and OS/390) operating systems. IBM has chosen Linux, as one of the "Native" Operating System for this solid architecture since 1999. The most important reason to implement Linux, on the S/390 platform was to consolidat the connectivity among Legacy Applications, Linux Applications and Middleware applications such as web server, mail server, application server, firewall etc. It is widely said that, Linux works as an API or emulation on the S/390 platform but it is not true, it works as a "native" operating system so that all the hardware capability of this platform is used. 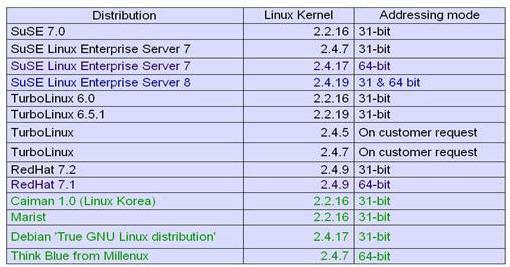 Linux Kernel and Common Code are used without any modification and the Linux system structure remains untouched. Only some "adaptations" are required to match and implement S/390 architecture specifics. It works with the ASCII character set instead of EBCIDIC. Linux can be installed in three different ways on a S/390 platform. Native Mode: It is installed directly on the system hardware, more likely not a preferred solution, because only one operating system runs on the hardware level. Logical Partitions (LPAR): With Hardware partitioning enabling up to 15 "Logical Partitions" each of which runs a separate operating system, traditional ones such as (MVS, VSE, OS/390) and Linux. 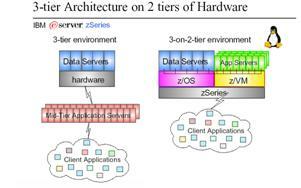 Virtual Partitions (z/VM): This is called z/Series virtualization technology. It supports for large numbers of Linux images (1000+) with rich system management capabilities on the same hardware. This way of installation is very flexible and great for server systems. If the required number of Linux servers is 15 or less, then the LPAR solution is a good choice. If you need more, 100 or 1000 Linux Images, z/VM will be the answer. Red Hat, SuSE and Turbolinux are major distributors for S/390 and zSeries. You can use the links below to download them. There are also some distributions in binary. You can get them from the links below. Millenux Think Blue distributes a Red Hat based Binary 31-Bit Linux for S/390 and a 64-Bit Linux for the z/Series. The Marist College uses Linux for S/390 since January 2000.
rnet, Token Ring, Fast Ethernet, ESCON, OSA or HiperSocket. There are more devices to support. Before Linux can use a device the associated driver for zSeries and S/390 device must be available to the kernel. There are kernel resident drivers and external drivers for S/390 and zSeries devices. External drivers are modules loaded on request with their parameters by means of commands. Resident drivers receive their parameters at boot time, from a kernel parameter line, held in a file. Why Linux for s/390 ? The most important reason is server consolidation. Each and every new server means, new hardware, space, capacity increase in cooling, cabling, connection etc. So every time those "physical" parameters have to be monitored and adjusted. All software has to be licensed in each server which means additional cost. For instance, your database has to be licensed on each server on a per CPU bases. Connectivity is another important issue. Cabling, gateways, switches, routers, all those components increase the total cost. Disaster Recovery (DR) Solution is almost impossible with individual servers. Operation and Maintenance costs of DR gets higher, more complicated and impossible with the huge number of servers. Database / Application / System Management issues, CPU and Workload Sharing have to be done individually, for each and every server. Although all Linux Images share the same hardware (CPU, I/O Subsystem, Memory, etc...) they behave like individual, mutually exclusive, logical servers and can be used for different purpose applications. In this way, the increase of the number of servers does not affect the maintenance costs. It can be monitored and controlled easily and saves time. While sharing the resources the throughput of the system is maximized. All servers share the same CPU, so that software license fees decrease. All the connections among servers are internal, so that, communication overhead because of hardware is almost nothing and network performance is maximized. Adding a new server is just easy as cloning of a logical server. Disaster Recovery is much more easy, realistic and feasible. DASD (Direct Access Storage Device) Farms and Subsystem can quickly and safely be copied in minutes with FlashCopy, PPRC (Peer-To-Peer-Remote-Copy) or Snapshot features.